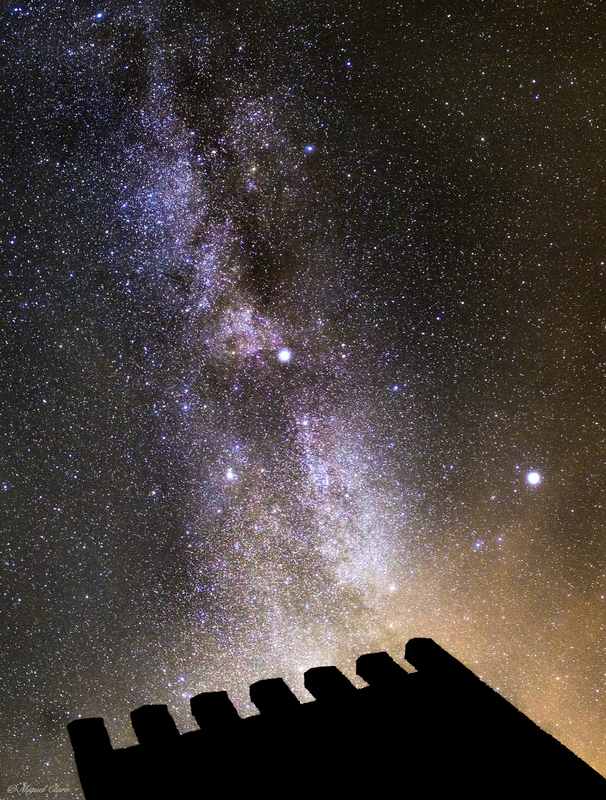 Being under a starry sky always fascinated me since I was a child. Specially, when I was trying to reach the stars, setting my foots on the floor, just extending my arm while I was feeling and thinking in the fact that there is nothing separating us from outer space. Under the nature our roof is indeed the Universe itself and the most exciting thing, is the knowledge that let us know that we are an important part of it! 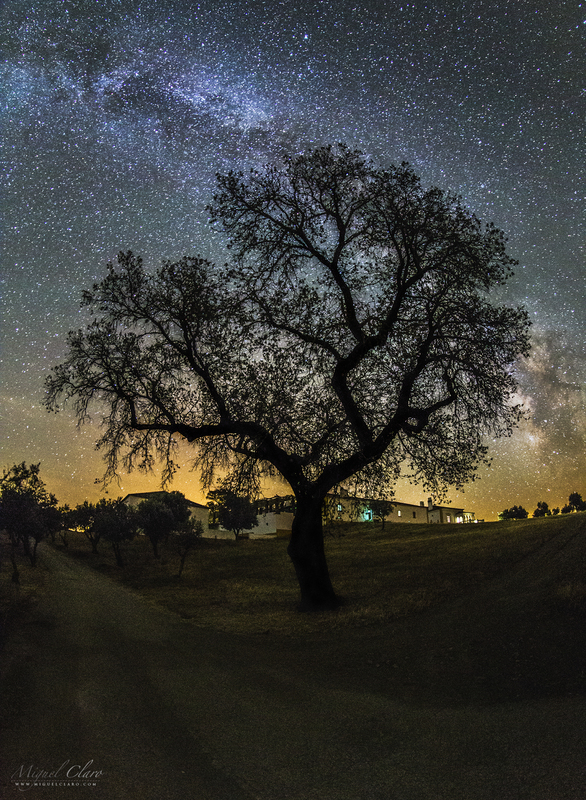 The image shows a Milky Way rising in the background over Noudar Park, in Alqueva Dark Sky® Reserve, Portugal. 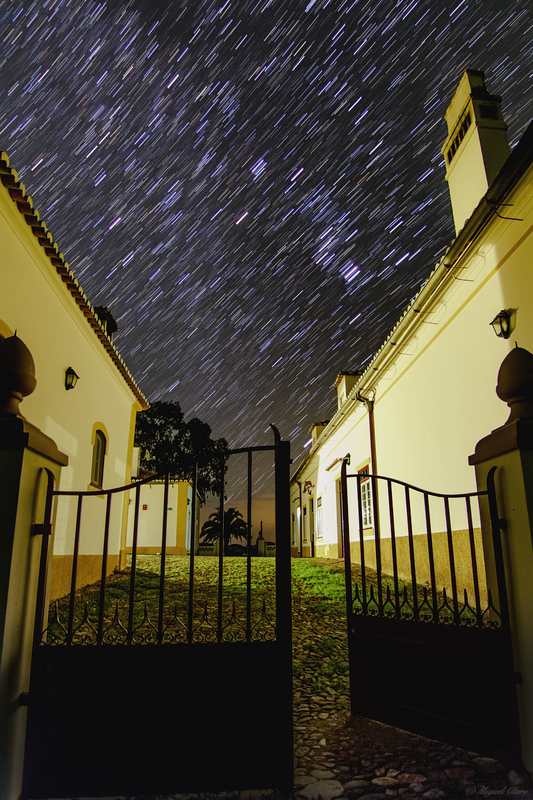 PT: Estar sob um céu estrelado sempre me fascinou desde que eu era criança. 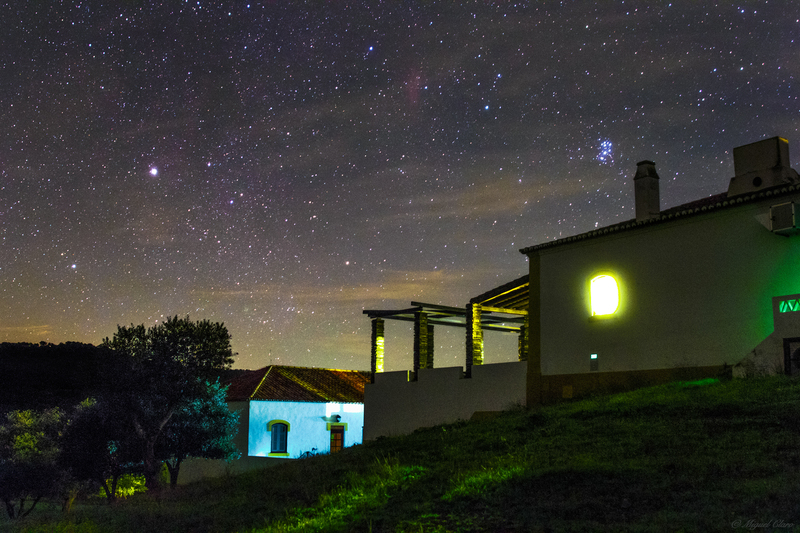 Especialmente, quando eu tentava alcançar as estrelas colocando os meus pés no chão, e estendendo o meu braço enquanto sentia e pensava no facto de que não há nada a separar-nos do espaço sideral acima. Sob a natureza, o nosso telhado é de facto o próprio Universo e a coisa mais excitante é o conhecimento que nos deixa saber que somos uma parte importante dele! 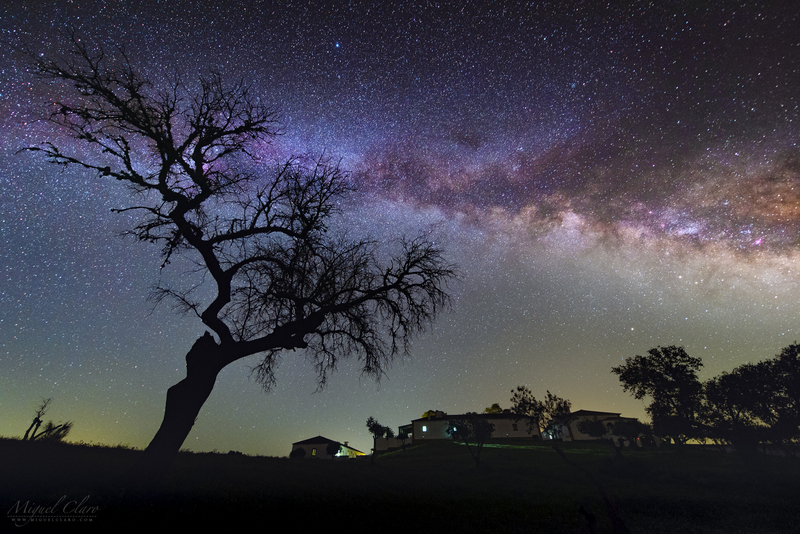 A imagem mostra uma Via Láctea a nascer em pano de fundo, acima do Parque de Natureza de Noudar, na Reserva Dark Sky® Alqueva, em Portugal. 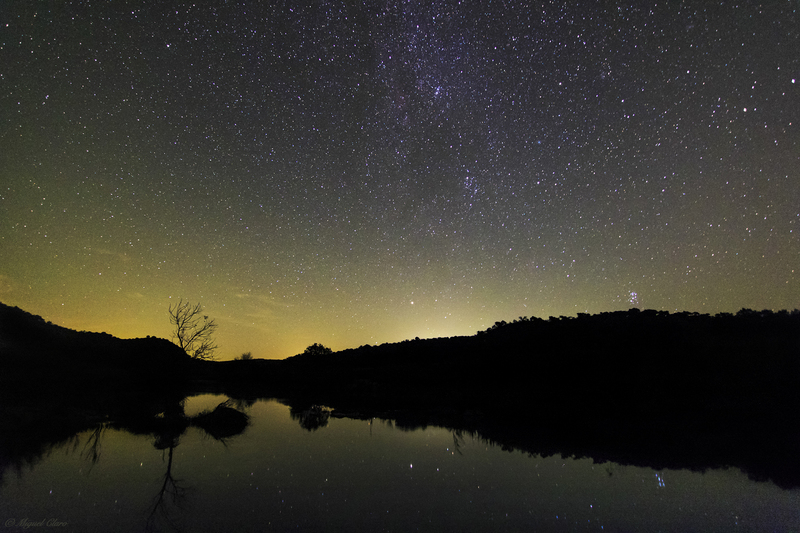 The image and short time lapse clip shows the Milky Way rising over Noudar Park, in Alqueva Dark Sky® Reserve, Portugal. PT: A Na imagem acima é possível ver o nascer da Via Láctea por detrás da paisagem do Parque de Natureza de Noudar. 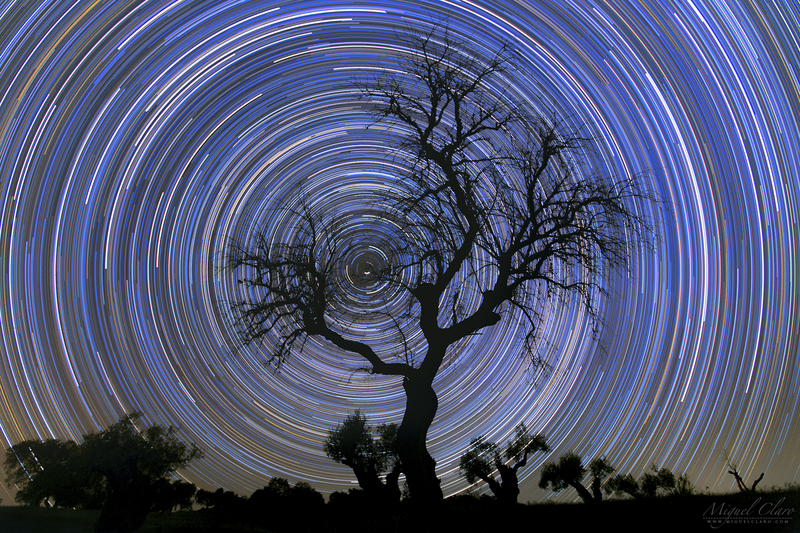 When we first look at the night sky, we can not distinguish the color of each star with our own eyes, although, if we record in a long exposure sequence the path of each star, due to the motion of rotating Earth and consequently the rotation of celestial sphere, a starry trailed sky can reveal much of our colorful Universe. 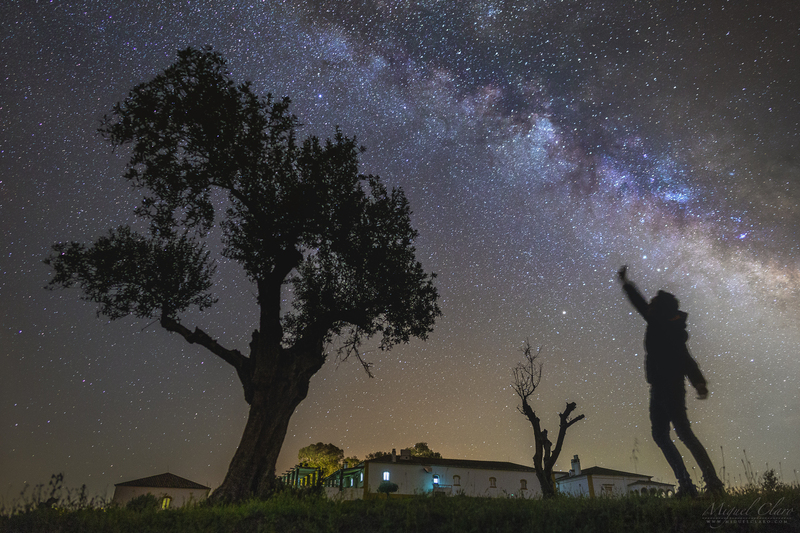 In the image above, captured in Noudar Park, Alqueva Dark Sky® Reserve, Portugal, we can see a lot of different color paths, like: blue, white, yellow or even orange. 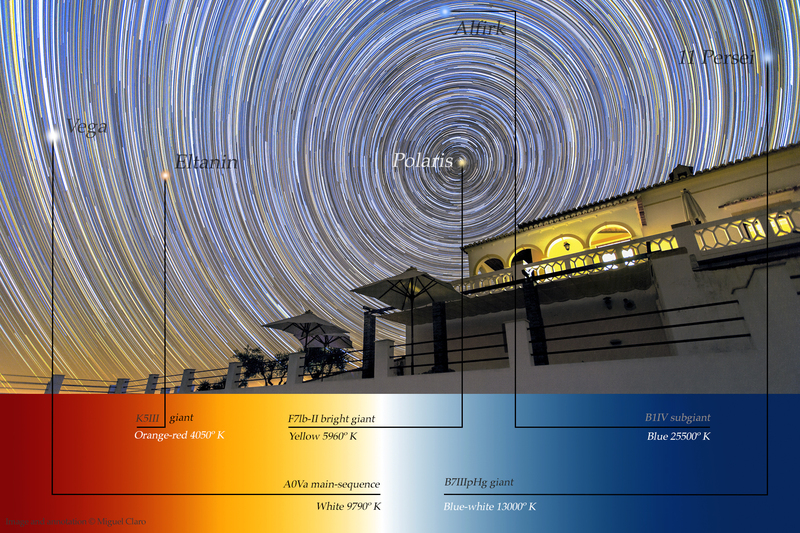 Each color is directly related to the type and temperature of each star. The hottest stars, are showing a blue color, but in opposition the coolest, can reveal an orange-reddish color. 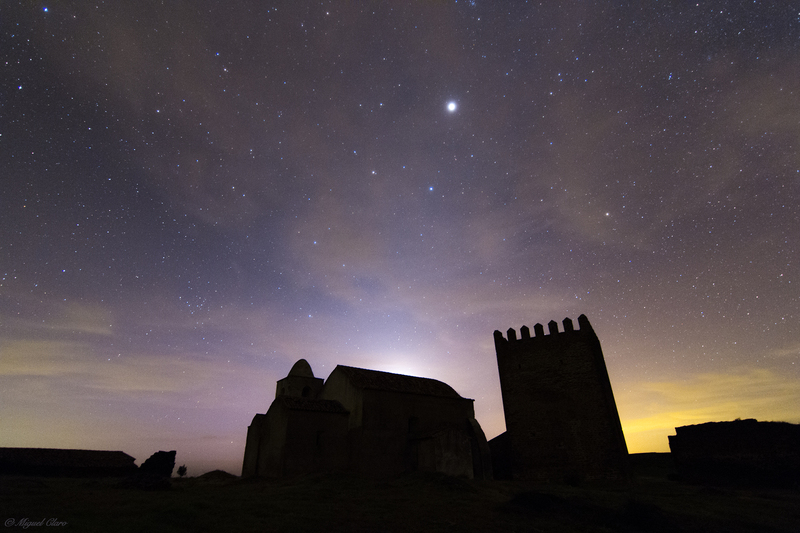 PT: Quando de noite olhamos para o céu não conseguimos percepcionar com os nossos próprios olhos a cor de cada estrela, no entanto, se registarmos numa sequência de longa exposição o rasto de cada estrela, devido ao movimento de rotação da Terra e à consequente rotação da esfera celeste, uma imagem startrail poderá revelar um Universo colorido e rico em informação. 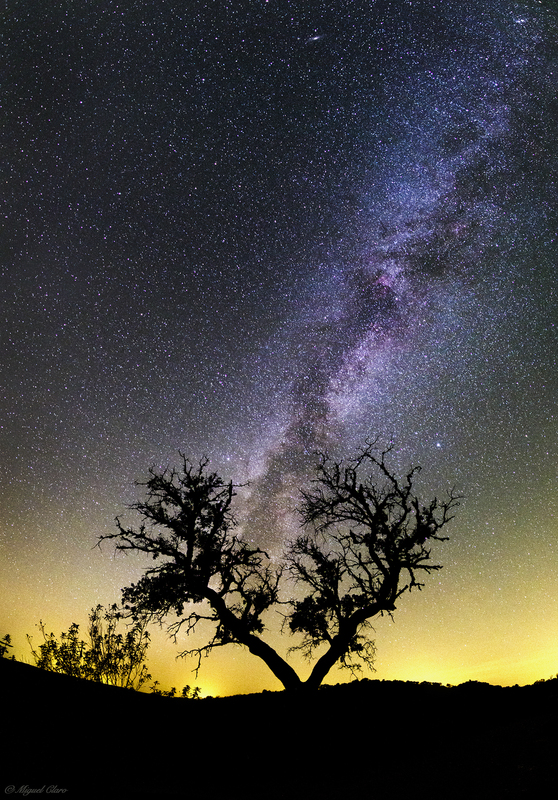 Na imagem acima captada no Parque de Natureza de Noudar, Reserva Dark Sky® Alqueva, em Barrancos, podemos ver uma grande diversidade de cores desde o azul, ao amarelo, branco ou laranja. 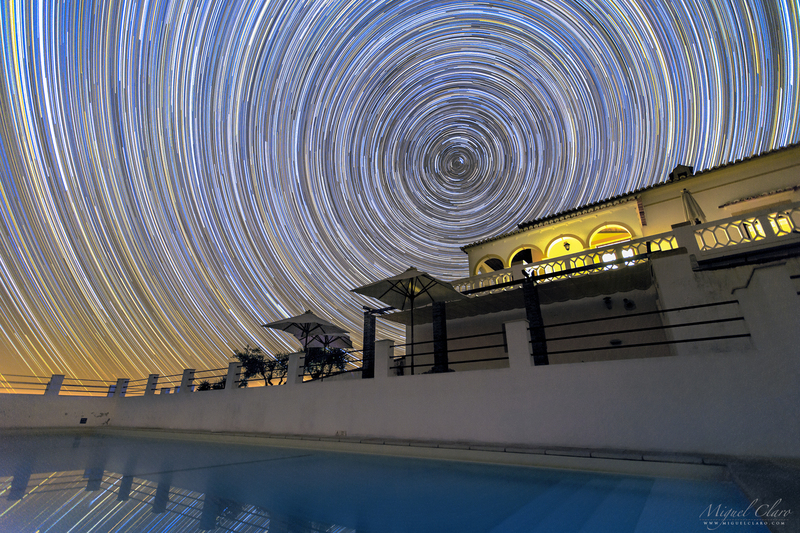 Cada cor está directamente relacionada com o tipo e temperatura de cada estrela. Algumas delas são mais quentes e por isso apresentam uma cor mais azulada, outras por sua vez são mais frias apresentando uma cor mais alaranjada. 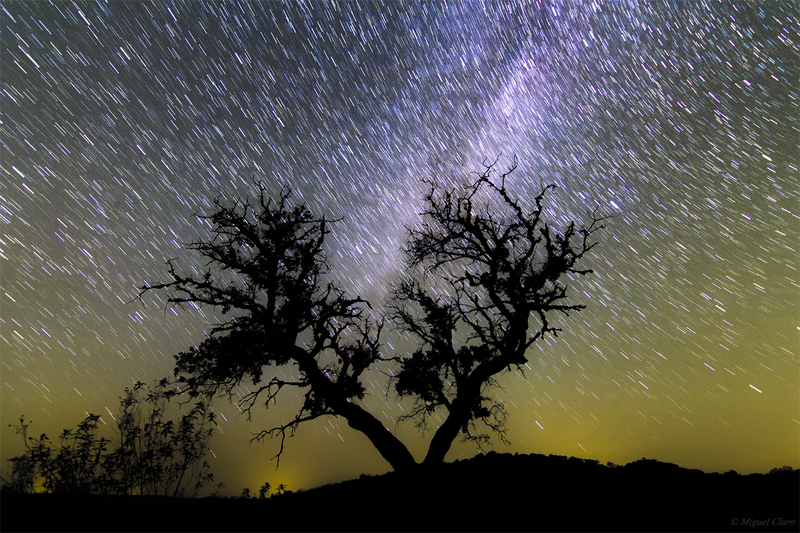 A path of light illuminates the foreground behind a dead tree that by illusion, seems to be part of the galactic arm of our Milky Way galaxy. 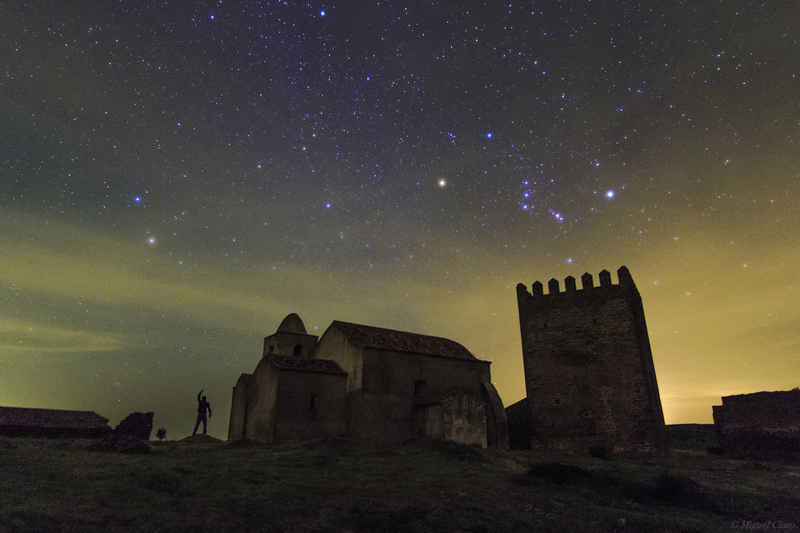 This magical and charm scenario under the stars was captured in Noudar Park, Alqueva Dark Sky® Reserve, Barrancos. PT: Um caminho de luz ilumina o primeiro plano por detrás de uma árvore morta que, por ilusão, parece fazer parte do braço galáctico da nossa Via Láctea. Este cenário mágico e de encanto sob a luz das estrelas foi captado no Parque de Natureza de Noudar, Dark Sky® Alqueva, Barrancos. 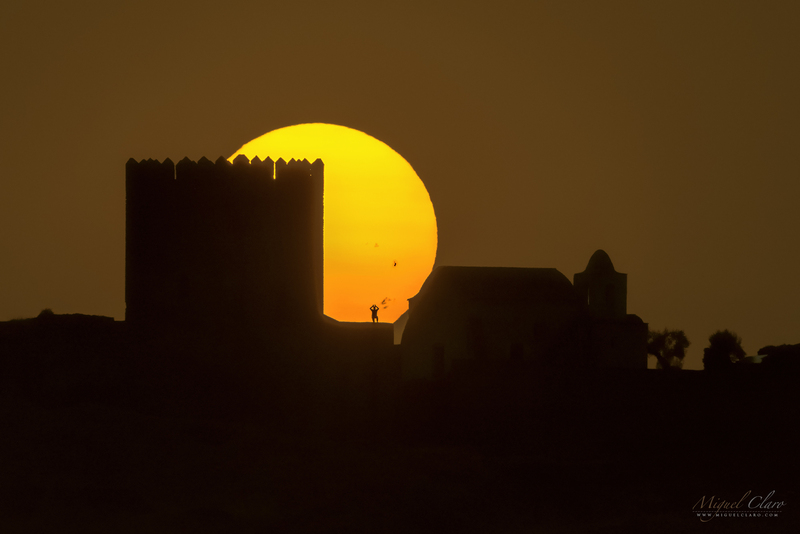 On this carefully planned single shot taken on September 7 with a telephoto lens at 600mm, 2,1km away from the Castle of Noudar Park, in Portugal, a skywatcher can be seen observing with its filtered binoculars the majestic group of sunspots (AR 2679; AR2674 and AR2673) well visible in the Sun´s disk just a few minutes before the sun going down behind the castle. On Sept. 6th at 1202 UT, the sunspot AR2673 – so large and wide as our entire planet Earth – (seen at the right side of the man´s silhouette) unleashed a major X9.3-class solar flare, the strongest solar flare in more than a decade. X-rays and UV radiation from the blast ionized the top of Earth’s atmosphere, causing a strong shortwave radio blackout over Europe, Africa and the Atlantic Ocean. The debris from Wednesday’s monster X9-class solar flare reached Earth last night, and its impact produced a severe G4-class geomagnetic storm. 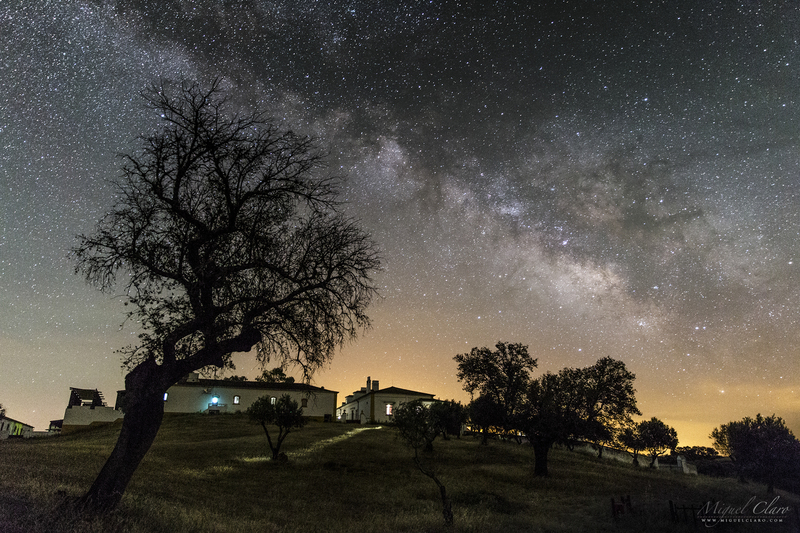 Included in the great Alqueva Dark Sky Reserve – first site in the world to receive the “Starlight Tourism Destination” certification – Noudar Natural Park is located in a farm estate called Herdade da Coitadinha spreads across 1000 hectare, near the village of Barrancos (Alentejo, Portugal) and in the border with Spain. The road from the Park’s entrance to the Noudar Castle goes through an extensive holm oak grove (‘montado’) area, ending with a majestic view over the water lines. In Noudar, life presents itself in a state of wilderness and absolute purity. The Castle of Noudar and the church of Nossa Senhora do Desterro is located between the Múrtega and the Ardila rivers which flow towards the West. Its construction was finished in 1307, during the reign of Don Dinis. The place was chosen because of its natural defenses, easy access and the closeness of a water spring of excellent quality. This medieval fortress was very important for border defense against the kingdom of Castile during the early 14th Century. PT: Este disparo único cuidadosamente planeado, captado no Parque de Natureza de Noudar a 2,1 km de distância do Castelo e onde podemos ver a silhueta humano de um amigo (Fernando Formiga), enquanto observava com seus binóculos filtrados o majestoso grupo de manchas solares (AR 2679; AR2674 e AR2673) bem visíveis no disco do Sol enquanto este se punha atrás do castelo. No passado dia 6 de setembro, a mancha solar AR2673 – tão grande e ampla quanto o planeta Terra – (vista à direita da silhueta) desencadeou um grande Flare Solar de classe X9.3, a explosão solar mais forte em mais de uma década. Os raios-X e a radiação UV da explosão ionizaram o topo da atmosfera terrestre, causando um forte apagão de rádio de ondas curtas sobre a Europa, África e o Oceano Atlântico. As partículas carregadas decorrentes da explosão solar da passada quarta-feira chegaram à Terra na noite passada, e seu impacto produziu uma tempestade geo magnética de classe G4, classificada como grave. Isto é, auroraras boreais muito intensas que poderão ser visíveis até de Nova Iorque. Um pequeno “behind the scenes” feito com o iphone foi partilhado na minha página pública e pode ser visto aqui. 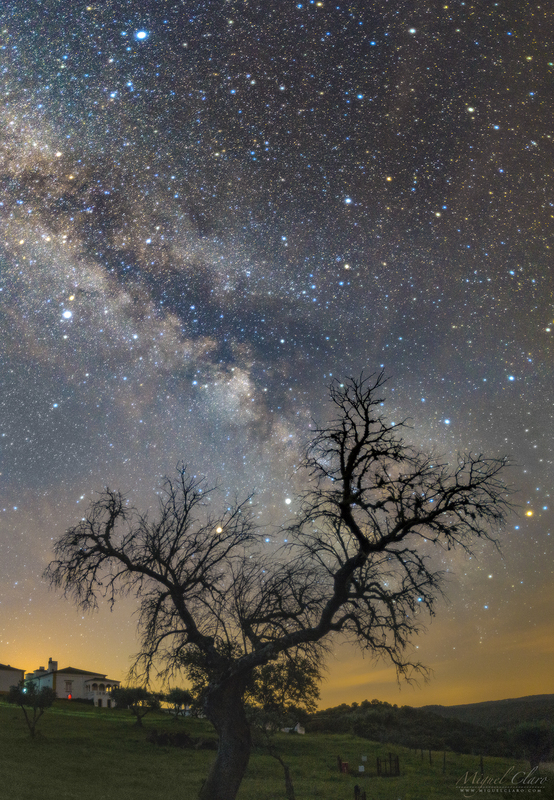 A path of light illuminates our land on Earth, but in the same way, a light cloud of gas and dust is shining bright and high in the sky of this full dome view. 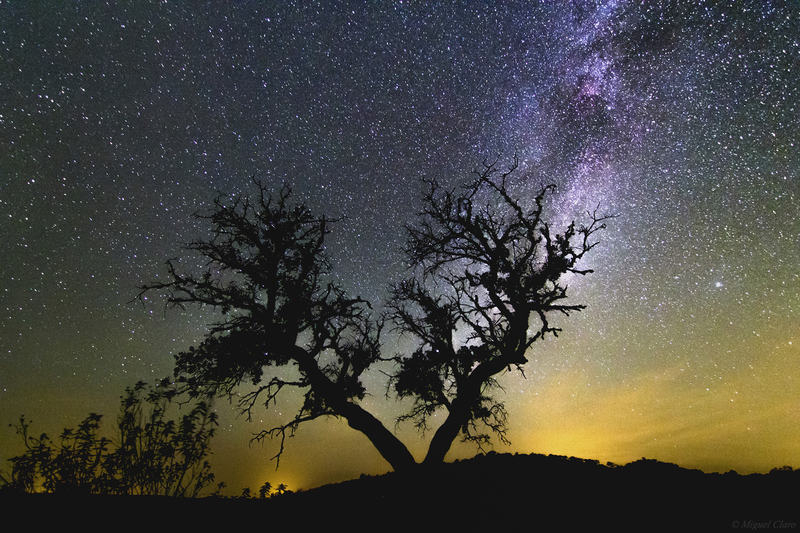 In the foreground, a dead tree is standing below the gigantic arc of our galaxy, the Milky Way. 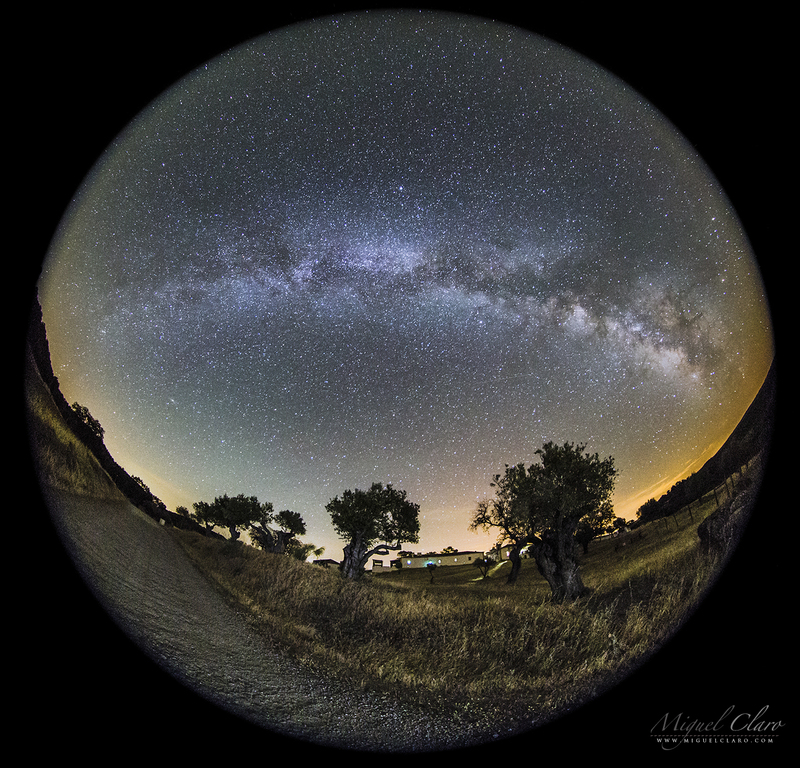 This “dreaming sphere” was captured in Noudar Park, Alqueva Dark Sky® Reserve, Barrancos. PT: Um caminho de luz ilumina a Terra, enquanto simultaneamente uma nuvem luminosa de gás e poeira cósmica brilha alto no céu desta visão “full dome”. 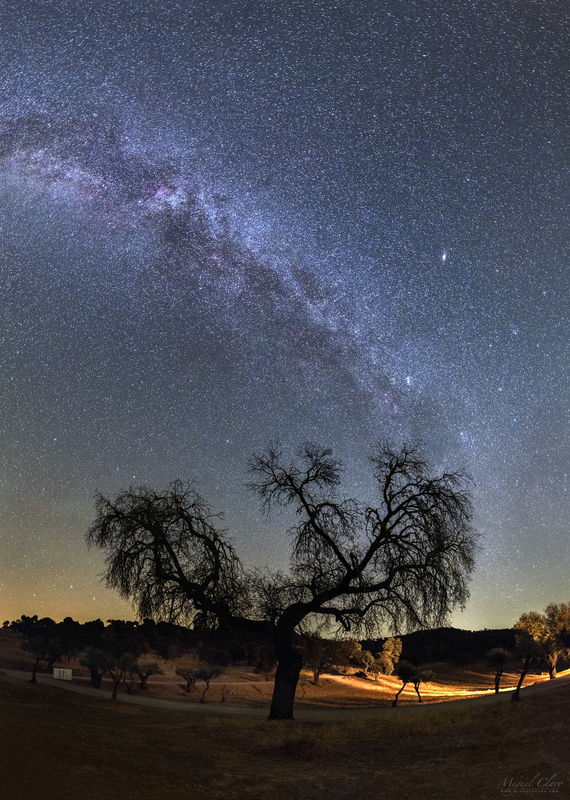 Em primeiro plano, uma árvore morta mantém-se erguida abaixo do gigantesco arco galáctico da Via Láctea. 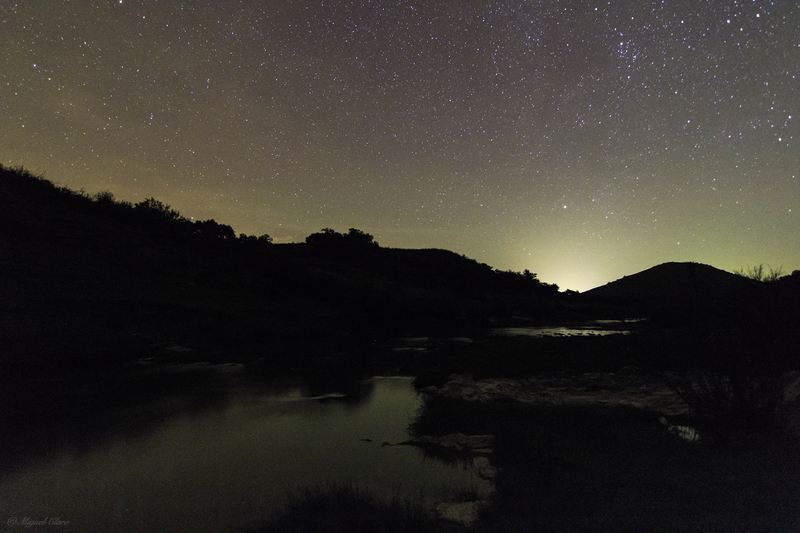 Esta “esfera de sonhos” foi captada no Parque de Natureza de Noudar, em Barrancos, na Reserva Dark Sky® Alqueva. 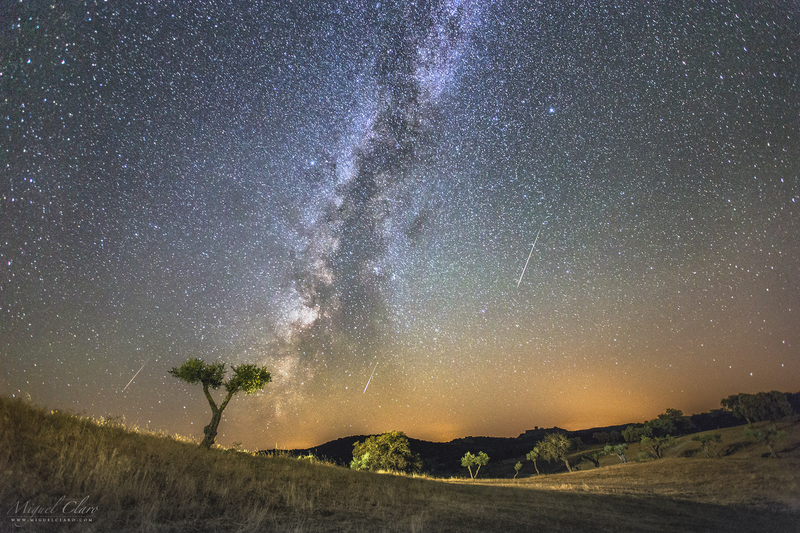 Some meteors from Perseids shower captured one week before the peak predicted to 12 August, above the landscape of Noudar Park, in Alqueva Dark Sky® Reserve, Barrancos. 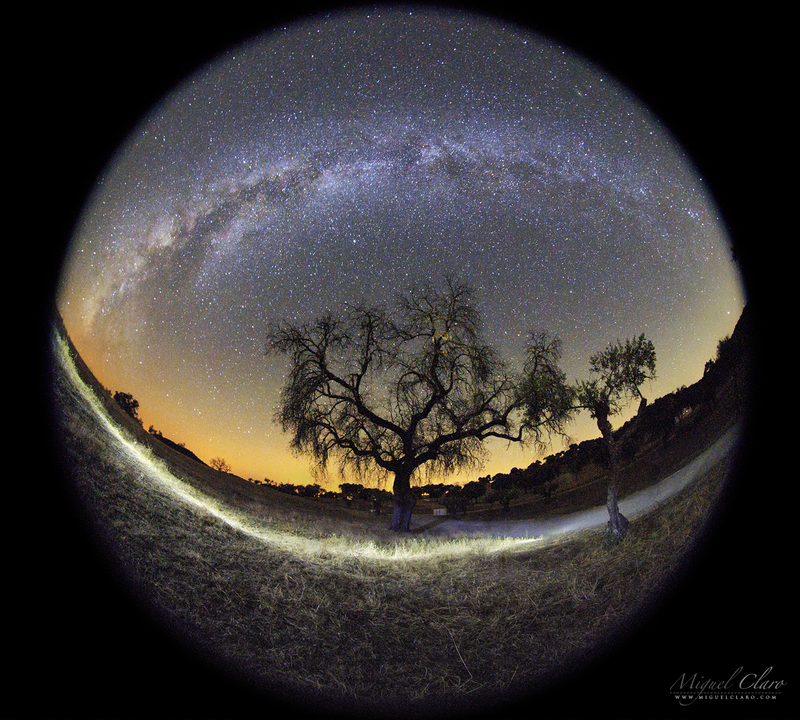 In the foreground an Olive Tree is at the left side of Milky Way. 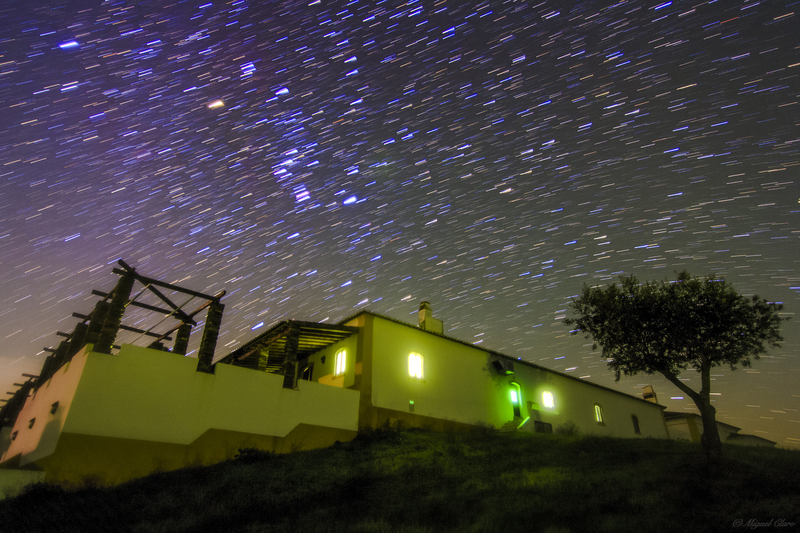 PT: Alguns meteoros captados uma semana antes do pico máximo da chuva de estrelas anual das Perseidas, previsto para 12 de Agosto. Acima deles, é possível ver o céu do Parque de Natureza de Noudar, em Barrancos, Reserva Dark Sky® Alqueva. No primeiro plano, uma oliveira destaca-se do horizonte à esquerda da imponente presença da Via Láctea. 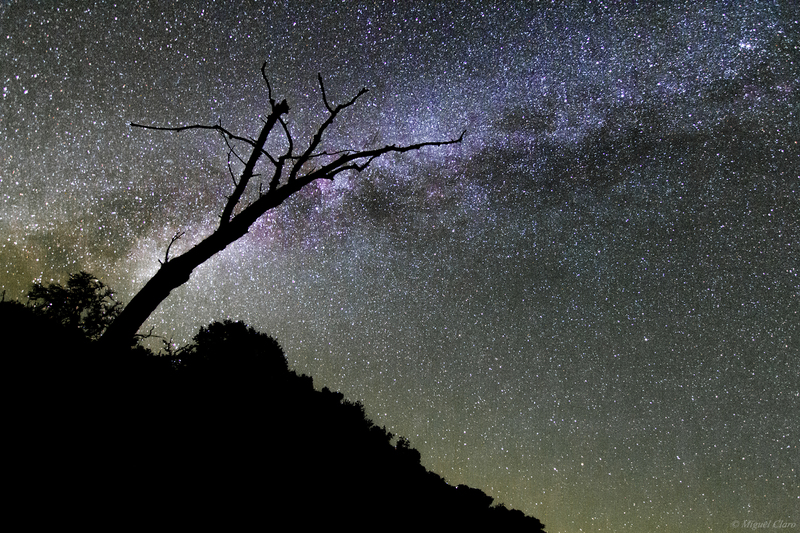 A tree lying on the Milky Way arm. 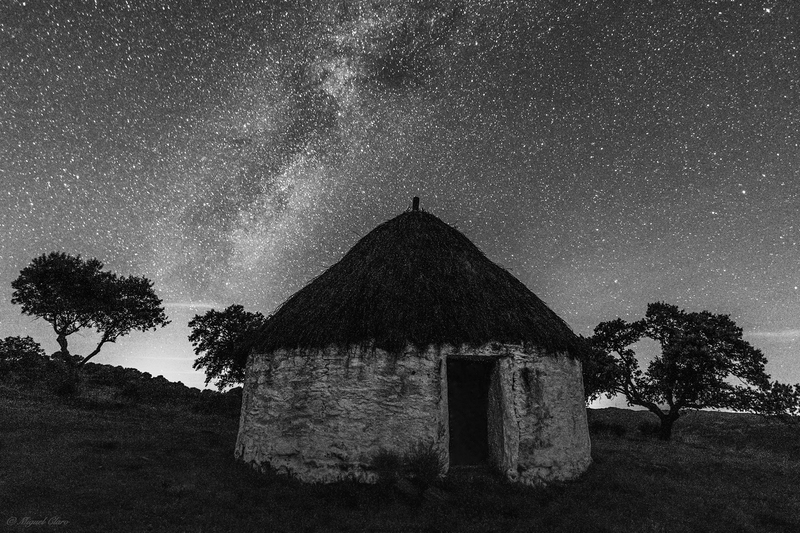 Included in the great Alqueva Dark Sky Reserve – first site in the world to receive the “Starlight Tourism Destination” certification – Noudar Natural Park is located in a farm estate called Herdade da Coitadinha spreads across 1000 hectare, ‘over-the-hills’ between the winding rivers Ardila and Múrtega and lodged among hills and summits near the town of Barrancos (Alentejo, Portugal) and in the border with Spain. The road from the Park’s entrance to the Noudar Castle goes through an extensive holm oak grove (‘montado’) area, ending with a majestic view over the water lines. In Noudar, life presents itself in a state of wilderness and absolute purity. 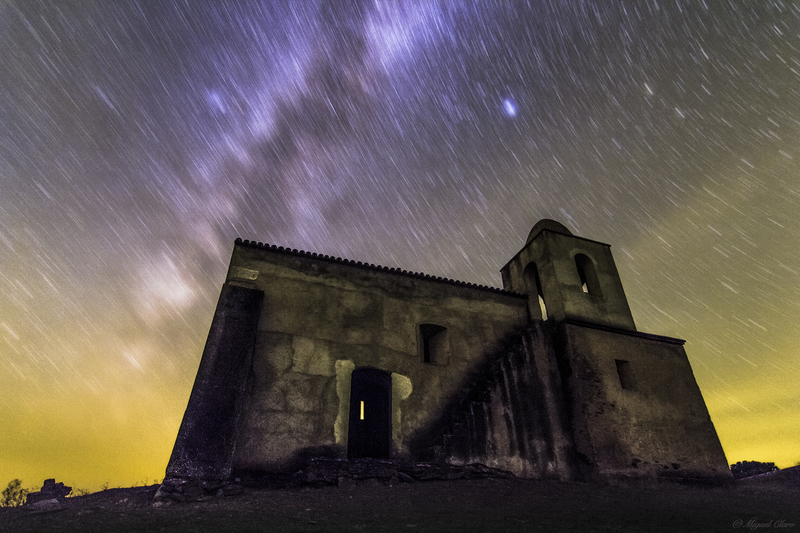 A dragged Milky Way behind the Church of Noudar Castle, called: Igreja Nossa Senhora do Desterro. * This “comet effect” in the stars is not natural and not visible in the sky and it is only showed here for an artistic purpose. 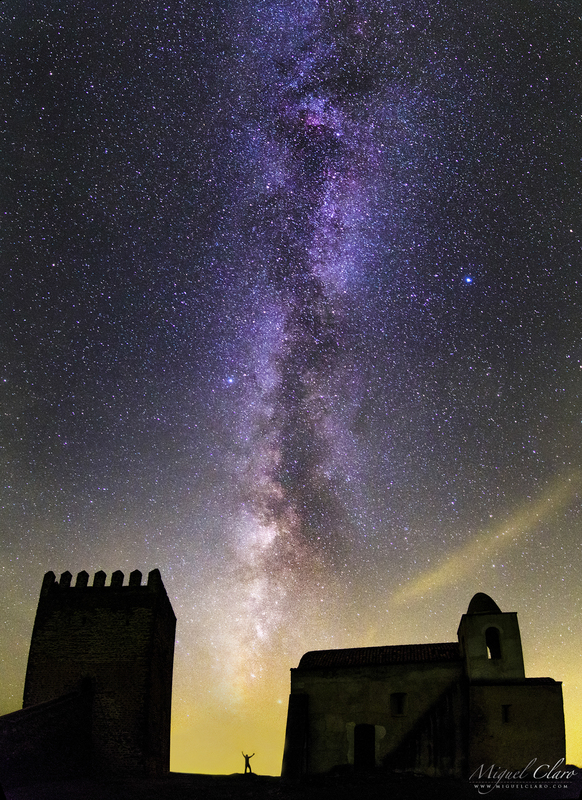 EN: The small size of our human presence against the greatness of the Cosmos, in a game of scales in which the loftiness of the Milky Way rises steeply above the Noudar Castle | Sky of Barrancos. 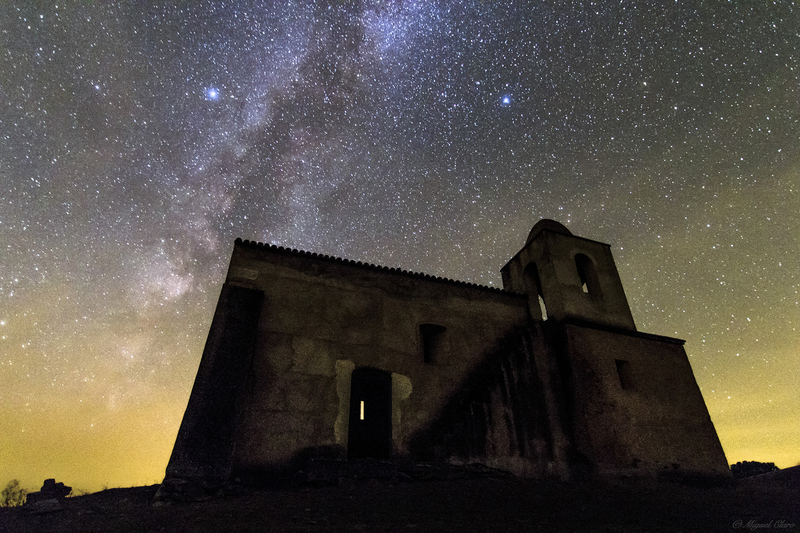 More about Alqueva Dark Sky Reserve: Alqueva is the first site in the world to receive the “Starlight Tourism Destination” certification. This certification, awarded by the Starlight Foundation is supported by UNESCO, UNWTO and IAC. 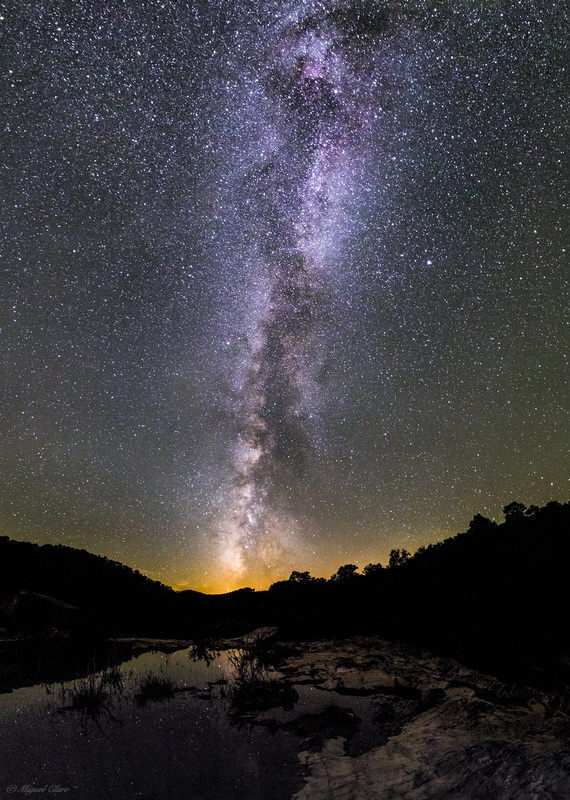 Starlight destinations are visitable places characterized by excellent quality for the contemplation of starry skies, and the practice of tourist activities based on this resource. www.darkskyalqueva.com | Canon 60Da – ISO2500 Exp. 30 Secs. 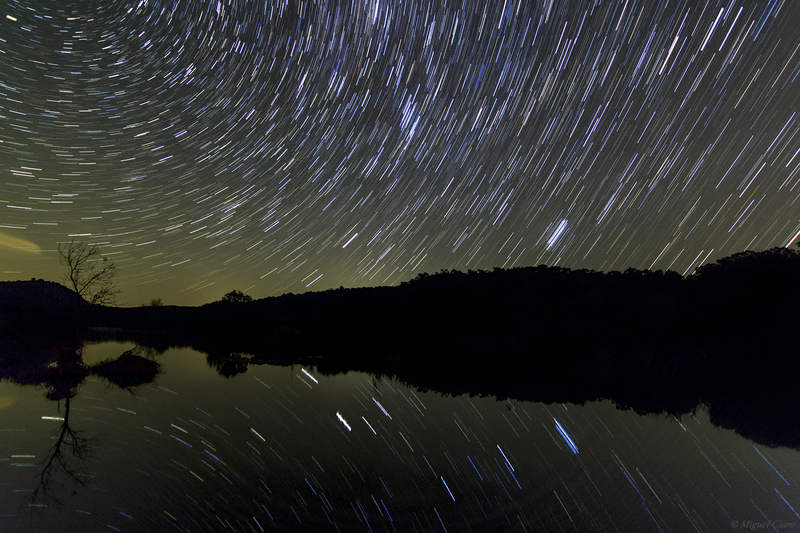 11mm at f/2.8 – Taken in 19/10/2014 at 22h23m. 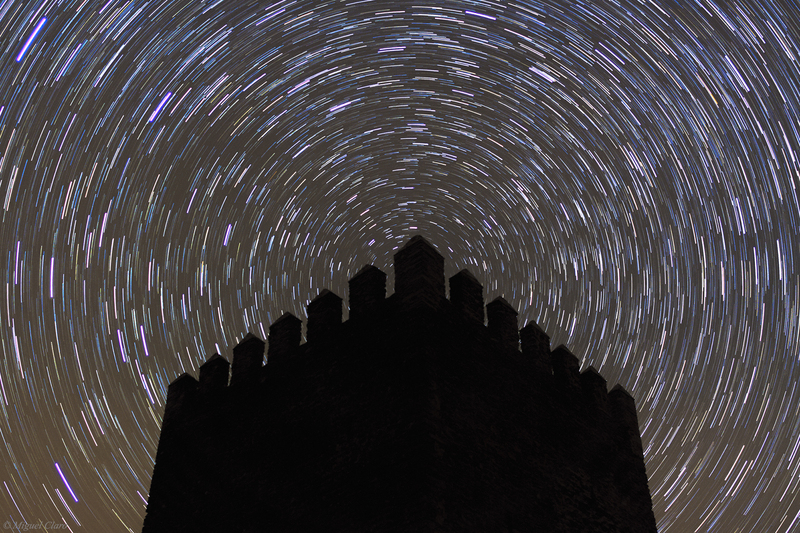 A northen startrail around the Tower of Noudar Castle. 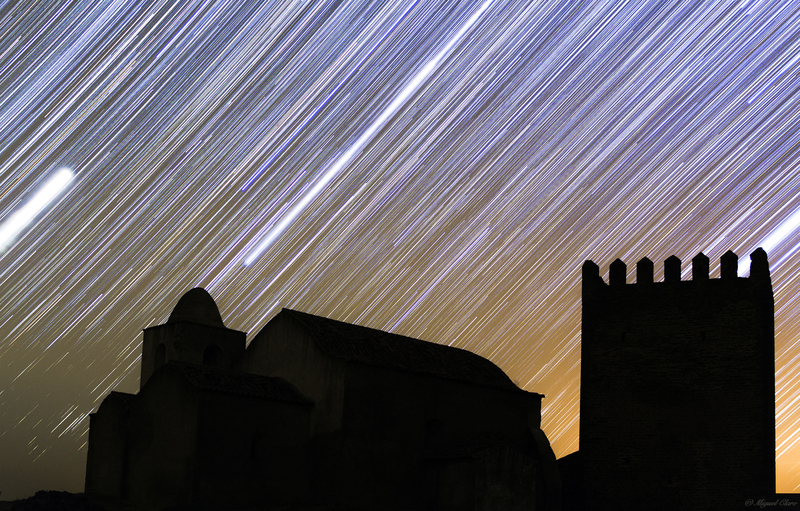 The Polaris is hiden behind the walls of the Castle. 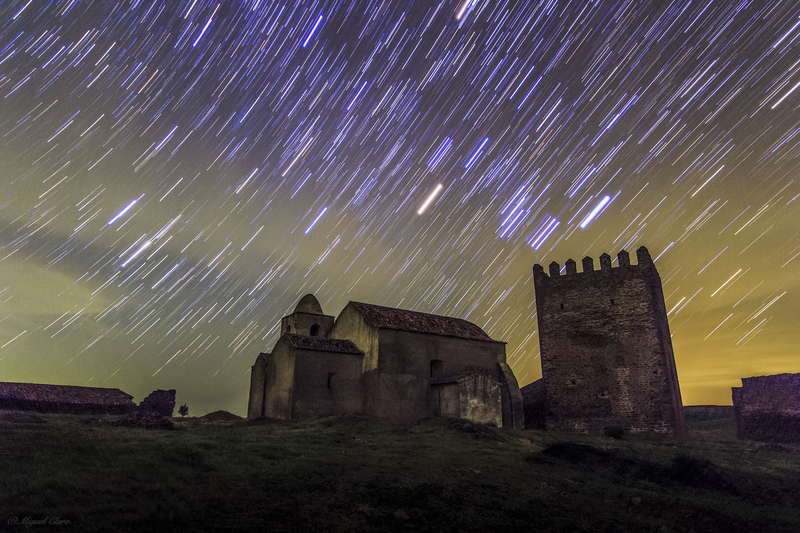 A startrail with comet effect* in the sky region of Milky Way behind the Church of Noudar Castle, called: Igreja Nossa Senhora do Desterro. “Choças” and “malhadas” are old agricultural structures used by shepherds of the Herdade da Coitadinha estate. The “choças”, small shacks built with stone or mud walls and thatched roofs, were designed to shelter shepherds and their families – many large families spent nights or even actually lived in these small spaces. “Malhadas”, usually located nearby, were stone fences used for keeping cattle. 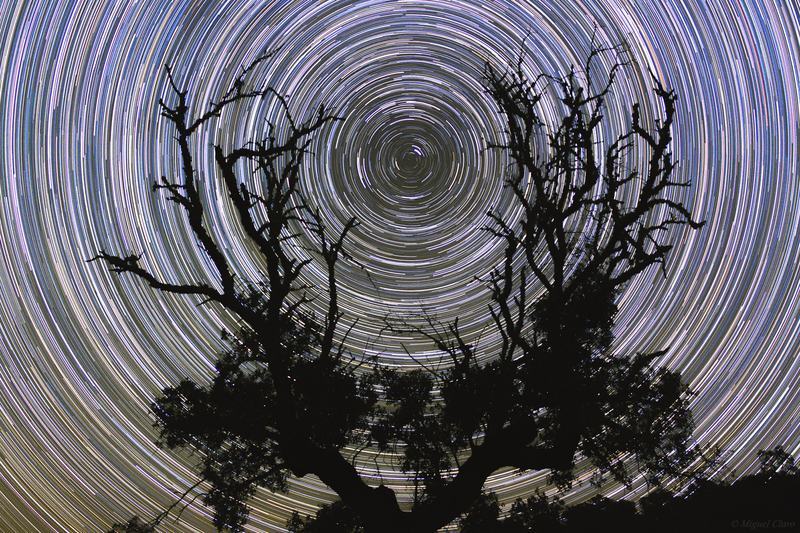 A startrail in the Orion sky region, above the Lodging gate of the Noudar starry sky Park. 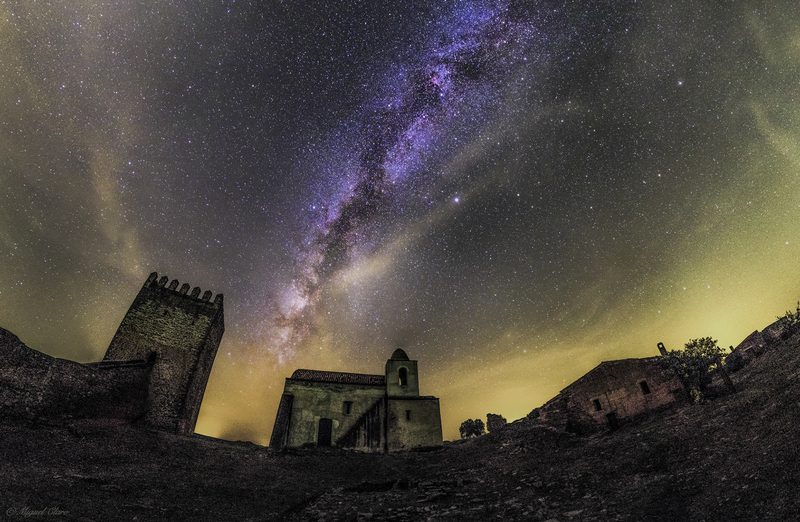 Milky Way behind the Church of Noudar Castle, called: Igreja Nossa Senhora do Desterro. 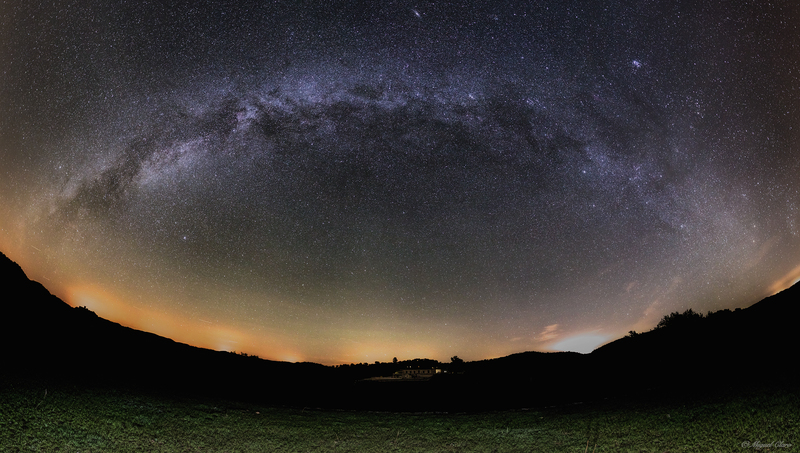 Milky Way Arc above Noudar Park, a view from Eira area. 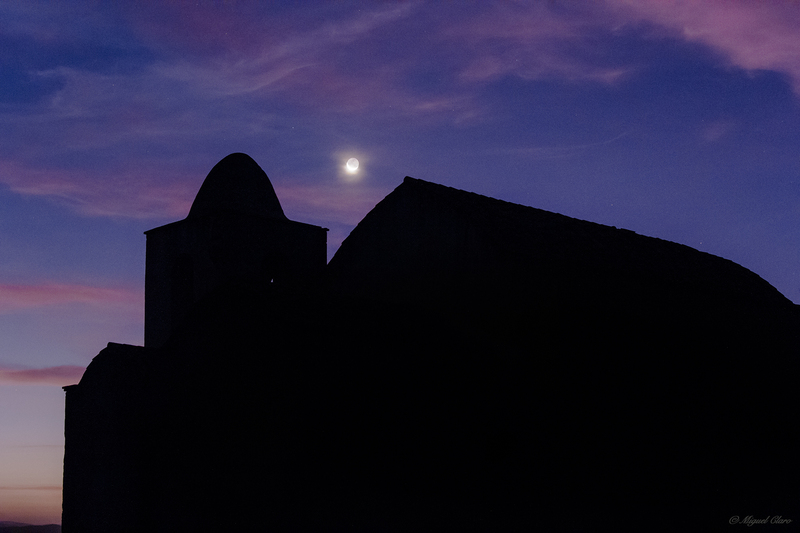 | Canon 50D – ISO1600 Exp. 20 Secs. 35mm at f/2 Mosaic picture taken in 18/10/2014 at 00h18.